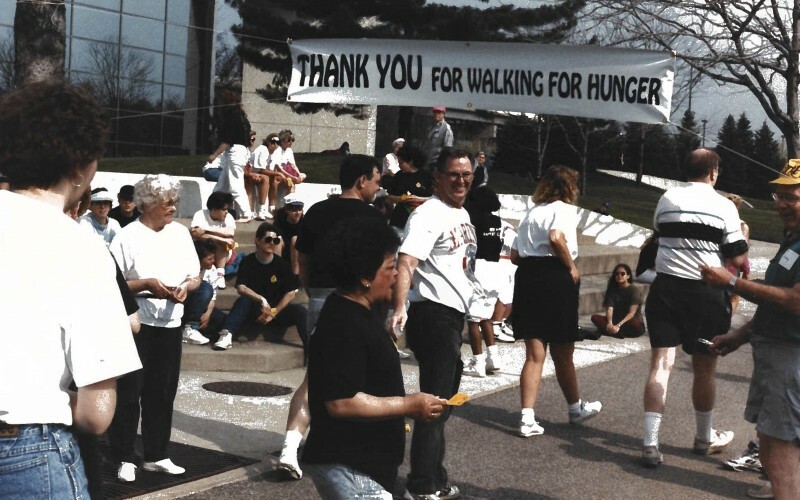 In changing the name of the annual Hunger Walk to the Walk for Good Food, Access of West Michigan celebrates forty years of food reform, looking ahead to future progress. A crowd of participants display a banner at an early Hunger Walk. A child dons a G.R.A.C.E. 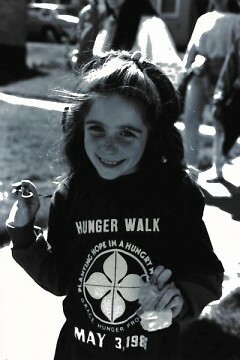 Hunger Walk shirt at the 1986 fundraiser. A banner thanking participants as they finish the Walk is displayed outside the Gerald R. Ford museum. The Access of West Michigan Hunger Walk is now the Access Walk for Good Food, and for good reason. The goal of the walk has not changed, but the rhetoric surrounding it has. Provision for those in need has always been, and will always be, the mission of the walk. However, this mission of provision seeks to address issues of hunger, poverty and food injustice at their source. While each organization that receives funding from the walk is in pursuit of a life-giving system of food, there are various approaches to this work. The name of the walk has changed to more accurately reflect the diverse responses to this shared goal, as well as its celebratory nature. Access is choosing to place an emphasis on goodness—the goodness of organizations fighting for these goals, the goodness of improving systems of food, the goodness of spring weather and delicious, shared meals. This year marks the 41st annual walk, and is planned to meander 3 miles through downtown Grand Rapids, Eastown, and the Heritage Hill Historic District. While the walk has not always traversed this same route, it has been held each year in public support of fair food and funding for organizations working to reduce local poverty. In 1977, the Grand Rapids Area Center for Ecumenism (G.R.A.C.E.) saw a need in the community and rallied to help, organizing the first Hunger Walk. At the time, around 190,00 people lived in the city, Herpolsheimer’s department store on Monroe Ave still opened its doors to shoppers daily, and Grand Rapids’ own Gerald R. Ford was fresh from the White House. Rod Stewart, Barbra Streisand, and ABBA were topping the charts, Star Wars was breaking countless box office records, and the “King of Rock and Roll” was soon to perform his last concert. Much has changed since 1977—participants no longer don velour tracksuits and white Reeboks for the event, the furniture capital of the world has evolved into Beer City USA, and G.R.A.C.E. has turned the annual fundraiser over to Access—but the reasons we walk are largely the same. While Herpolsheimer’s is long gone, the need that sparked the Hunger Walk has not. A lot of good has been done. The first Hunger Walk raised roughly $1,200. Since then, more than $6 million has been donated to both local and international anti-hunger programs, and thousands of individuals have been involved. 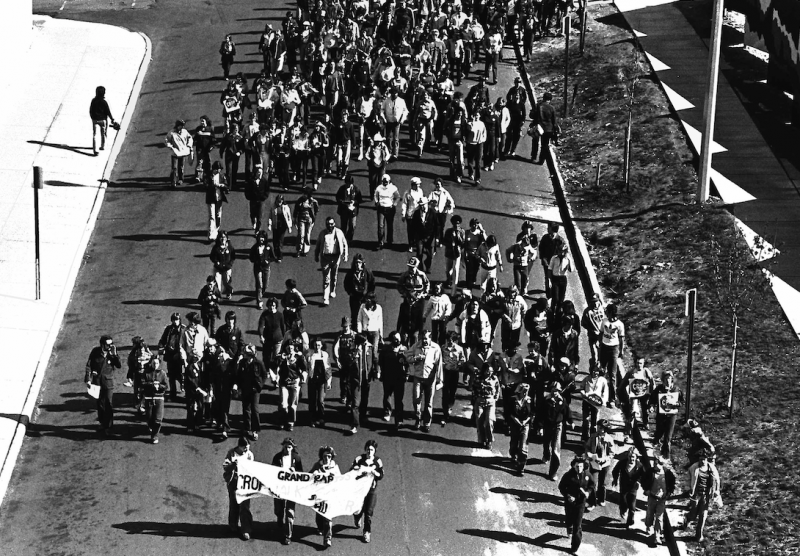 In changing the rhetoric, Access of West Michigan seeks to both honor the history of the walk and reflect its future aspirations. A life-giving system of food delineates one in which the production and consumption of food is fair and provides nourishment that is available to all people. A fight for food justice means food that is healthy, fair, affordable, and sustainable. 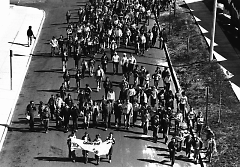 Existing food systems were in need of reform in 1977, and the 2018 Walk for Good Food is demonstrative of that continued need as well as a celebration of the reform that has been done in the past. And so, we walk to publicly stand against the unjust systems of food production that leave many hungry. We walk to promote and provide food that is life-giving for both those who sell it and those who receive it. We walk in remembrance of forty years of food reform, looking forward to the day when there are enough loaves and fish to feed the world (or, preferably, balanced meals).